Pilgrims march outside Camp Justice. Operation Imposing Law in 2007, there were rumours that United States' forces built walls around Al-Kadhimiyya Mosque. According to Iraqslogger.com, the protests that resulted were due to an agreement between Iraqi security officials and the Mahdi Army (now called the Peace Companies) that US forces would not come within 1,000 metres (3,300 ft) of the shrine. Pilgrims to the shrine were attacked on 30 April 2016, leading to wider protests. Souq in Al-Kāẓimiyyah with the shrine in the background. 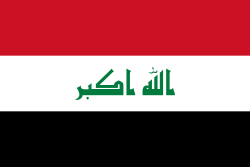 Iraq hero". BBC News. 2005-09-05. Retrieved 2013-11-09. ^ Exclusive "Bridges of Baghdad" Report. ^ "“No One is Safe” The Abuse of Women in Iraq’s Criminal Justice System" (Archive). Human Rights Watch. February 6, 2014. Retrieved on December 25, 2015. ^ Partlow, Joshua. "For Baghdad's Uprooted Girls, School Offers A Hard Haven" (Archive). Washington Post. February 16, 2007. Retrieved on May 6, 2015.